The IZT DAB/DRM MultimediaPlayer can be used as a very powerful tool for the analysis of audio and data content, perfectly-suited for professional monitoring and archiving solutions. It supports the standard protocols for multiplex distribution (EDI, MDI) as an input signal. The IZT DAB/DRM MultimediaPlayer software can directly decode audio and data content of the digital radio standards DAB/DAB+ and Digital Radio Mondiale (DRM30/DRM+). 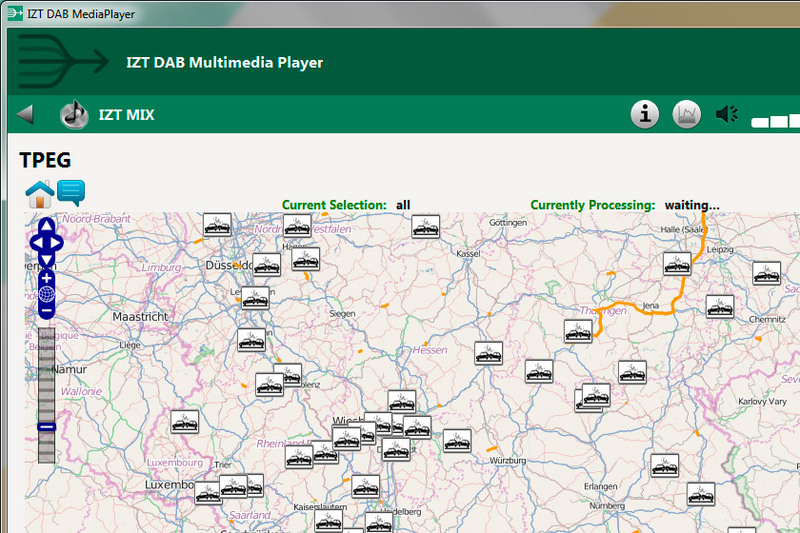 sound, the IZT DAB/DRM MultimediaPlayer offers unique features – including the simultaneous presentation of data services such as album covers, text messages, weather forecasts, traffic information and sports results directly in the player. Remote access to the user interface via web browser is also possible, encompassing the reproduction of every audio and data service component within the HTML5 standard. Depending on the customer’s requirements, the IZT DAB/DRM MultimediaPlayer is available as a software-only or custom-tailored, integrated server solution. Additional monitoring and logging functionality (e.g. loudness, audio analysis) may be available on request.